You are fresh out of college with a degree clutched in your hand. Get ready world, you are going to do big things…eventually. First, you have to find a job, figure out a living situation, somehow replace the muffler on your car AND come up with enough money to make a payment on your student loans. Retirement is a distant dot far in the future and your bank account isn’t exactly bursting, but oddly enough, this is the perfect time to start saving for retirement. Why? Because every dollar you put into a retirement plan today will have over 40 years to grow. The money you earn on your investment each year will grow, and those earnings will grow, and so on. Time is the most potent factor when it comes to saving for retirement. The more time you give your money, the bigger and bigger it will grow! No matter what your financial situation, I bet you can spare at least a little income each month for your retirement account. (You can even save for retirement on just $5 a day!) The best way to save is to automate your contributions so they are taken right out of each monthly paycheck. This way you never see the money and don’t feel the loss. Make a promise to yourself to put away a specific percentage of your income (10% is a good number) into retirement. The great thing about this policy is that as you earn promotions and raises, you’ll increase your savings along with your income without feeling it. For example, Josh gets a job as a graphic designer when he is 24 and earns $2,000 a month. Each month, he puts $200 in his retirement account. By the time he is 29, Josh has earned several promotions and switched to a different company who offered him more money. He now earns $6,000 a month. Since Josh is dedicated to saving 10% of his income for retirement, he puts $600 into his retirement account each month at this point. That’s a nice increase in his savings that will continue throughout his career. Check to see if your company offers a 401(k) and then be sure to open an account. 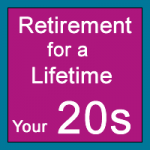 (Read our great article on 401(k) Plans Explained.) Your HR department can also set up automatic withdrawals so that your 401(k) is automatically funded with each paycheck. Many companies also match a certain percentage of their employees’ 401(k) contributions. If this is the case, be sure to invest up to the limit your employer will match. For example, Josh’s employer matches 50% of contributions up to 6% of income. Josh’s income at age 24 is $24,000 a year. If Josh contributes $1,440 to his 401(k) (6% of his income), his employer will kick in $720. That’s free money that will grow for Josh until he retires! If your company doesn’t offer a 401(k) or you are self-employed, open up an individual retirement account. You have choices on whether you would like to open a traditional IRA where your contributions are deductible currently and can grow tax-deferred until you take withdrawals, or a Roth IRA where you can’t deduct your contributions currently but you wont be taxed on withdrawals when you retire. Speak with a qualified financial planner to determine which option is best for you, and check out our article, To Roth, Or NotTo Roth. Consider investing in a target retirement fund that will automatically dial down the risk as you age, and continue to make contributions into that fund. That way, you can set it and forget it. Even as your portfolio bounces up and down, your fund manager will be monitoring it and adjusting the risk as you get older. That way you can resist the urge to continually tinker. You don’t have to watch it day by day – after all, you are in it for the long haul! You can learn more about saving for retirement by reading our informative retirement article archive just for women.